Actor Services: Studio Rates – Just for Actors! We’re passionate about the voiceover industry and helping those who have what it takes to succeed. We have many services and one-on-one options to help you reach your goals. The audition recording services we offer are for actors in all levels of their career, whether it is a seasoned actor or someone just starting out in the industry. Seasoned actors are encouraged to work with us and get some constructive feedback, which is important in the ever changing world of voiceover acting. Some projects can be effectively completed from a home studio; however, many bookings want more expertise that a home studio just can’t offer. 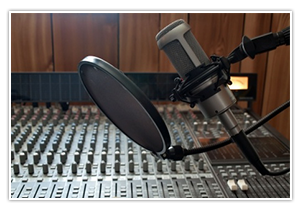 We offer invaluable services that a home studio cannot provide. We believe that each voiceover talent is unique and should be treated as such. We encourage you to call us to discuss any projects you are working on and we can provide you with quotes and specific information that meets your individual and unique needs. Let our professional engineers focus on editing and getting you a quality recording so that you can spend time reviewing the script, perfecting the tone, and rehearsing. Ultimately you will set yourself above the competition and leave with a high quality recording that you will feel confident submitting. A typical appointment is 30 minutes that consists of booth recordings and time for our engineer to edit and perfect your files. Of course if more time is needed, we can customize the appointment to fit your needs. The cost for an audition is a minimum of 15 minutes for $15. Don't stress about your voiceover audition! Record it at Garden of Sound. Let us worry about editing and set yourself above the competition witha high quality recording. Your time starts as soon as you get in here, so come prepared with scripts printed. If we print your scripts here, your time begins when we start printing and preparing your material - so please email to us beforehand. Looking to strengthen your reads and increase your bookings? Join us for our monthly intesnsives and workshops! To learn about our upcoming workouts and to join us, Click Here.